Add garlic to mixer bowl, chop for 3 sec/speed 9/MC on. Add onion to mixer bowl, chop for 3 sec/speed 5/MC on. Scrape bowl down. Add butter and cook for 5 min/100 degrees/speed 1/MC off. Add water + stock concentrate (or liquid stock), mushrooms, soy sauce, and black pepper to mixer bowl. Cook for 10 min/steaming temperature/speed 1/reverse/MC on. Add tapioca or corn flour to mixer bowl, ensuring there are no hard lumps. Cook for 3 min/100°C or 212°F/speed 2/MC off. You can now blend on speed 9 for a smooth gravy. You can substitute the butter with olive oil for a dairy free option. For an onion gravy, omit the mushrooms and increase onion to 200 g or 7 oz thickly sliced brown onion. The colour does come from the mushrooms, so expect a lighter gravy. You can use vegetable stock concentrate for a vegetarian version, however be aware that the colour may be lighter. Omit the Tapioca Flour for a LCHF version, simply cook for an additional 5 minutes. At step 4 use ST temp if using an Intelli and 120°C or 250°F if using a Supercook. At step 5 use speed 3 and when blending after cooking, slowly increase speed from speed 4 to speed 9 for approx. 10 seconds. Been wanting to make this for ages. Craving some red meat so decided I needed mushroom gravy and if could only be Skinnymixers. It did not disappoint. Smelt amazing cooking and tastes even better. This was really nice. I added some truffle salt at the end and only used 1 teaspoon of cornflour and that was more than enough. Thanks for a winner! Truffle salt would’ve been delicious! I think this could do with a bit of sherry and more garlic. While the consistency of the gravy was beautiful, the taste was a tad bland. Sooooo good, it’s definitely worth a full bowl lick with some bread!! Gonna use over bangers & mash as requested by Mr 4!! Made this last night to go over steaks. Fussy Dad loved it! Yum, yum, yum. Love this! Yum, yum yum!! Have made this several times to use on steaks. Last night made it to use as a base on a mushroom pizza. We added mozzarella cheese, chopped thyme, sliced portobello mushrooms and slivers of salami. It was delicious!! OMG so yummy! I blitz mine at the end because I have one kiddie that doesn’t like the texture of mushies, I kept scooping out spoonfuls whilst I was cooking rest of meal, I was eating it like soup lol. Big thumbs up! What is steaming temperature please? Oh yum! I’m on a challenge, so this used very sparingly on my turkey & cauliflower mash turned a bland meal into an absolutely delicious meal, thanks! Really enjoyed the mushroom sauce. Was very easy. Made it without the Tapioca so was a little runnier but made no difference to the taste. So thank you for a great recipe. This was brilliant and so tasty! I left out the flour for a LCHF version and it was great, really lovely on a steak – thanks Nik!!! Yum! This was perfect. Didn’t add any flour as I felt it didn’t need it as there wasn’t really any liquid, and didn’t blend at the end – just nice chunky mushrooms. Made with vegie stock as well – it was sooo good. Made tonight to serve with cold roast lamb. Made the onion version and it was very nice. I cooked for the extra 5 minutes but didn’t need this long. Delicious and so easy. Definitely be adding that to the weekly menu. Oh my, that gravy is delicious!! Must say the best I have tasted! 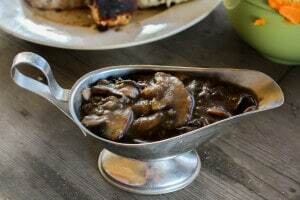 This is a beautiful gravy, I didn’t blitz because we love mushrooms. I can see this being a weekly sauce I our household! Wow this is really tasty and easy- a neither winner from the SK TEAM!!! Silly question but new. What is the MC? This was so good!! The BEST gravy ever!! I halved the recipe because I only had 200g of mushrooms and used vege stock paste but was still delicious! We really enjoyed this gravy tonight, though I would like to try it again without blitzing it as the colour put the kids off a bit, until they tried it and realised it was delicious! Was very tasty and easy. I used tapioca flour and would also like to try again like other comments suggested to just cook longer with MC off as I had to thin mine down with more stock. Thanks for a quick and easy gravy recipe! Best. Gravy. Ever. Make it, make it now!!! Another success! Whole family loved it. I have made a few more batches and frozen in serves for emergencies! Defrosts beautifully. I made this to go with dinosaur steaks. I also didn’t blend it at the end, we like the chunky mushroom vibe! Seriously delish sauce. Hubby loved it and he is hard to please when it comes to sauces! I made this tonight whilst my whole chicken and vegs (cooked in the varoma and rice basket) were browning off in the oven. I used chicken stock paste. It was terrific. I’ve only had my Thermomix for a week, so still have my ‘training wheels’ on, however I made this last night to go with steak and it was amazing!! I skipped the blending step at the end – thanks for the recipe! I love this gravy! Has anyone tried making it ahead of time and then re-heating? Just wonder if this works well or is it best to make fresh? We had it on top of some delicious gourmet beef sausages and TMX mash potato. I made this as hubby only ever has mushroom sauce on steak, great taste but found it really runny. I didn’t have 400g of mushy so maybe that had something to do with it.? Absolutely delish!! Cooked it with mushrooms and no flour. Blended at the end and the mushrooms gave it the perfect thickness. The colour was a little undesirable but we all loved it! Oh my this is AMAZING! This will be my go to sauce from now on! Keep sneaking some whilst steak is cooking. Thank you for another awesome recipe. My new go to mushroom gravy. So yum. Thank you!! Saw your mushroom sauce on my news feed while hubby was cooking steak on the BBQ and surprised him. “Bloody beautiful” was his response. My two non-mushroom eating DS ate this by the spoonfull on their rice and vegetables. Winning!!! Love mushrooms and this sauce is so easy and delish! Love the leftovers on toast! Loved this gravy! I added a teaspoon of mushroom powder, which I made from various dried mushrooms from the health food shop or supermarket (eg porcini). Place any 2 packs in thermomix bowl then on speed 9 until it is a fine powder and store in air tight container. Absolutely delicious. Big thumbs up from hubby. No need for steak just eat it by the spoonful. Absolutely yummolicious!!! A lovely flavoursome gravy. I didn’t have onion, so subbed in leek and only had chicken stock, so subbed that too. Really great. I will definitely make again and will also try blending for a smooth gravy at some point. 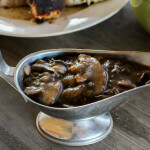 I love this Mushroom Gravy, it’s become a firm favourite in our home. Really liked this. So easy to do with ingredients I always have in the house. Had it with steak, mashed sweet potato and some steamed veg. Hubby liked it too! Thanks for the recipe. Amazing so so yummy i was licking my thermomix bowl! I have done the beef/mushroom version a few times now and love it! Tonight I used chicken concentrate and onions. We had visitors whom ate it by the spoonful ! Thermomix gravy is something I hadn’t brought myself to trying… Just couldn’t go past gravox. But with trying to cut out numbers and convert our diets alot I thought I’d give this one a go but with a twist. Cooked roast chicken in the Varoma so used the juices with a tbsp of vegge stock concentrate. Also skipped the mushrooms as unfortunately the step kids don’t eat them. Fingers are crossed for a good gravy. I love this sauce! I’m garlic and onion free and unless I’m in a hurry I skip the tapioca. That makes this a one step saice… I just throw everything in and cook for 18 minutes varoma speed 1 with the MC off when there is 8 minutes remaining. Its a great base to modify too. I omit mushrooms and replace half of the stock (100ml) with red wine to make a red wine sauce. I also omit mushrooms and use 1 tsp cracked black pepper to make a pepper sauce. I’ve also made a red wine pepper sauce (LOL) doing both these things and its great! I’ve also doubled my variations without mushrooms and cooked 22 minutes varoma spd 1 with MC off at 10 minutes remaining with success. Sooooo good. I was craving mushrooms last Nte and thought I’d give this a go. I didn’t have 400g mushies but didn’t realise this til after I’d added the initial ingredients (I probably only had about 200g) but just went on to cook it for 5 mins longer (with tapioca flour added) and it was perfect! Will be a staple gravy in our home. Thanks Nikalene! Nik, you are amazing. Another awesome recipe. Another winner. Loved it with steak, even added a dahs of cream – NOMS. Thanks Nik!! This gravy was superb with no cornflour/tapioca flour and cooked for 5 extra mins with the mc off. Thanks for the recipe and guidance about avoiding the flour, you’re a superstar! Had this gravy on steak and vegetables tonight. Absolutely delicious. Thanks for sharing your lovely recipe. I made this last night with onions instead of mushrooms and served it on top of paleo rissoles. Really, really good! I just made this sauce for chicken schnitzel. Oh my goodness….it’s so delicious!!! This is soo good. Perfect on top of my steak. Hubby is in love too.